WifiTrak, a $1 app from Bitrino, finds available wireless connections. It’s meant to serve as a more feature-rich replacement for the built-in wireless detection found on the iPhone’s Settings screen, and it works as advertised. The only question you’ll need to answer is: Do you have the need WifiTrak aims to fulfill? Who, Where, Wi-Fi: WifiTrak sorts the nearby wireless networks by signal strength and whether they’re open, closed, or redirected. If you wield an iPod touch, or frequent areas with good Wi-Fi saturation but lousy EDGE/3G coverage, you’re part of WifiTrak’s target demographic. At an interval of your choosing, WifiTrak scans for available wireless networks. The Settings app does that, too, but WifiTrak’s presentation sets it apart. You’ll see one of several color-coded icons next to each wireless network WifiTrak finds. At a glance, you can tell whether a network is open, locked, or redirected (as in, to a login or payment page). Even better, WifiTrak sorts the available networks smartly. Open networks with strong signals are listed first, and weak/locked networks come at the end. You can login to secure networks from within the app, and it remembers (and highlights) networks you’ve already connected to successfully. WifiTrak can optionally play a custom sound (which works even on the first-generation iPod touch’s internal speaker) when it finds open networks; it can automatically connect to discovered networks as well. Unlike the built-in Settings, WifiTrak lists hidden networks, which can save some considerably tough touch-screen typing if you’re attempting to connect to a network that doesn’t broadcast itself publicly. Not everyone needs WifiTrak’s features. But if you’re constantly on the lookout for good, strong open Wi-Fi in areas with lots of wireless networks, WifiTrak will certainly help you get online a bit quicker. 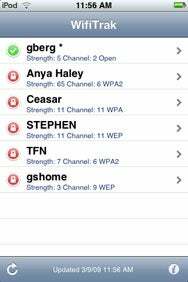 WifiTrak is compatible with any iPhone or iPod touch running the iPhone 2.1 software update.